Garmin's nüvis pack top of the line features into a slim form factor. Clearly, the display is the main differentiator of the nüvi� 5000. With nüvi 5000's large, clear display, you won’t miss a thing. View map detail, driving directions, photos, play games and more in bright, brilliant color. Its sunlight-readable, 5.2-inch display is easy to read and gives you an extended view of your surroundings. nüvi 5000 also includes a composite video input so you can connect it to a rear-view camera for backing up safely. Garmin's "Where Am I?" feature is a useful safety feature on all nüvis, but voice recognition makes it even better. On any nüvi (including this one), you can just tap "Where Am I?" to find the closest hospitals, police stations, fuel stations, nearest address and intersection. Also see your exact latitude and longitude coordinates. With the 800s, all you have to do is say "Where am I?" to get the info. Comes ready to go right out of the box with preloaded City Navigator NT street maps, including a hefty POI database with hotels, restaurants, fuel, ATMs and more. Simply touch the color screen to enter a destination, and nüvi takes you there with 2D or 3D maps and turn-by-turn voice directions. Garmin gets its map data from NAVTEQ, a world leader in premium-quality mapping. Important note about map updates: Due to our high volume of sales, almost every Garmin portable GPS navigator sold by Amazon.com will come with the most recent map version. 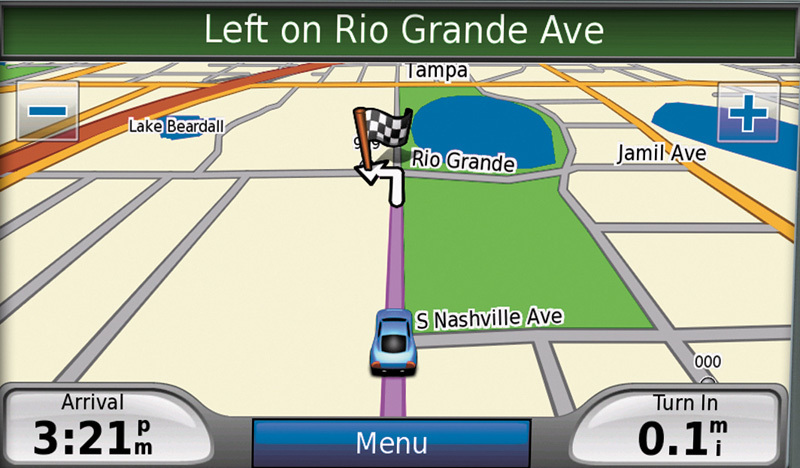 If you ever do need a map update, you can purchase one from Amazon.com at our Garmin Store. Browse your stored pictures with an easy-to-use JPEG viewer. A handy MP3 player lets you play songs stored on SD memory cards. nüvi accepts custom points of interest. Navigation is just the beginning. The nüvi features travel tools including JPEG picture viewer, MP3 player, world travel clock with time zones, currency converter, measurement converter, calculator and more. It also comes with Garmin Lock, an anti-theft feature, and configurable vehicle icons that let you select car-shaped graphics to show your location on the map. First, I would like to say that I really like my Garmin nuvi 5000. It is the first GPS unit I have ever owned. It is very easy to use and the large screen is very visible in all light levels. However, there are three areas where I feel the unit falls short. First, it needs a rechargeable internal battery that would allow it to be used disconnected from the automobile, even if only for a short period of time. The battery life would be extendable by having a way to switch off the screen and allowing the unit continue to operate. Second, the unit needs a better manual that goes more detail about the working of the unit. For example, it tells you how to add favorites locations to your unit's memory, but it does not tell you how many locations you can have, nor does it tell you if an SD card will add space for more. The third and biggest problem with this unit is the lack of a good internal antenna. My experience has shown that the unit is not very good at acquiring satellites as it is designed. I have experienced the following problems using the unit mounted on the beanbag holder (Garmin's Portable Friction Dashboard Mount) on my car's dashboard: When parked in my driveway with a clear overhead view, it can take more then 2-3 minutes to acquire a good signal lock; Pulling out of my garage and driving down suburban roads at less then 40 miles per hour, it has taken more than 10 minutes to get a good lock on the satellites; Once when driving down an Interstate highway with a wide open sky view, the unit lost signal and took several minutes to re-acquire the satellites; and at other times it has showed it poor design of the internal antenna. To try to solve this problem, I purchased the external Garmin antenna. 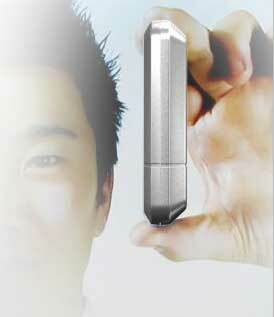 This antenna is designed with a magnet to attache to the car roof and plug into the back of the unit. This works very well and solves the problem of satellite acquisition, but makes for a messy dash. However, I found that if the antenna is just placed horizontally on the dash behind the unit it works just as well. This brought me to conclude that the unit should be designed with an attached flip up antenna, as come commercial unites have, to improve satellite acquisition. I gave it four stars, because with the added antenna, the unit works great and I would not want to give it up. I am a long time owner of the Garmin StreetPilot 2720 and bought the NUVI 5000 for the larger screen. The larger screen is great but, it's performance is poor. A lot of the time routing is just bad, routing me in circles. Sometimes it tries to route me via an old destination. The POI function, even with the "On current route" feature shows POIs behind me and far off route. I am a Garmin fan but, I regret this purchase. Update: After more problems, mostly lockups and failure to draw screen (map display), Garmin replaced the unit. Unfortunately, the problems with poor routing continued. I have had one lock up with the new unit. Also, false alerts about safety camers started to appear. We are in the middle of a 5,000 mile trip out west and this unit is unreliable and disappointing. The main reason I purchased this unit was that I really liked our older Nuvi but I wanted a newer unit with a video input for a reverse backup camera. The problem with this unit is that the very first time it goes to switch to the video input after the unit is powered on, even if you have auto switch on for the video input, the unit is going to stop you with a nagging disclaimer screen that you MUST agree to. You have to touch the screen. It won't go away after a short delay like the first nag screen does. Plus it takes quite some time before you even get there since you have to wait for the unit to "start up". Seems kind of funny that the disclaimer is that you shouldn't watch video while driving. Isn't the whole point of a backup camera to be able to look at it to make sure you don't run into something? There's no way around the nag screen without touching the unit except to just wire the unit to be always on. Even more confusing is that the video input setting has a mode for reverse camera but if you set it to this mode (instead of dvd), then it will ask you if you want to change EVERY SINGLE TIME!!! UPDATE 1) Called Garmin Support, after "researching" it, they told me that that was it, and that's how it worked, and there was no way to get rid of the video warning screen. UPDATE 2) Checked the unit's firmware and was amazed to see a really old version on there. Downloaded the latest firmware and the problem is SOLVED!! Now the backup camera mode works properly and it NEVER prompts you. Not even a delayed warning after power-on. You still need to wait for the unit to boot and it does take a while but as soon as it does, it immediately switches over to the video input. I do wish it could switch over even faster at unit power on. I'd update my rating to 4 stars but this edit page won't let me. We took a trip this past weekend and overall the unit is very nice. The auto-dimming screen feature works great. This unit also displays the current speed limit and it was amazing at how accurate it was. It would switch within a second or two of passing the speed limit signs. Review updated from 1 to 4 stars.